Now, technically I'm sharing this recipe because it's a component you'll need for what I share on Friday. But here's a secret: this stuff is delicious all on it's own. Like...really delicious. But trust me, what I've got for you on Friday is like...CRAZY delicious. Out of the world scrumptious. Inconceivably tasty! Which totally makes up for all the self control you'll need to not just scarf this stuff down. It's really addicting. I had a hard time stopping myself from constantly eating little pieces. So good! 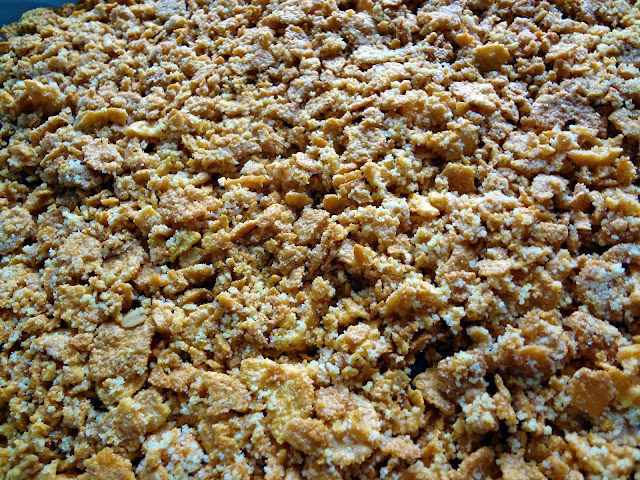 In a medium bowl, use hands to crush cornflakes to a quarter of their original size. Add milk powder, sugar, and salt, and toss lightly. Add butter and toss to coat (the butter acts as the glue and will create small clusters). Spread the cornflake clusters onto a parchment/silpat lined baking sheet. Bake 20 minutes-until they look toasted, smell buttery, and crunch when cooled slightly. Cool completely before storing or using in a recipe. Stored in an airtight container at room temp., it will keep fresh for 1 week; in the fridge or freezer, it will keep for about 1 month.